You turn on the radio and hear the tail end of a song. It is a musically haunting, lovely segment, but you hear less than sixty seconds before it ends. However, this is radio and songs are often play over and over till you're sick of them, right? So you continue listening hoping you encounter it again. A few days pass and again you turn on the radio at about the very same spot catching only the final refrain! And it is driving you crazy. But the radio station is playing a lot of good selections and you are taping those making a "favorites" tape, and now you have this 40 second rendition of the song's fade out. You don't know who the artist is nor the song's title. Finally, after days and days of waiting you get to hear the whole song and just as you suspected it is an incredibly amazing piece; enough to give you goose-bumps. You stop what you're doing to give it your undivided attention, total concentration, to experience it with every sense of your being. And you are moved. So you walk to the nearest music store and buy the tape, and even if it was to be the only good song on the entire album it would still be worth the cost. You get the tape home and play it from the beginning, and low and behold, the first song is as remarkable as the one you've heard on the radio. Not only that but the following piece is fantastic as well; and the one after that! And pretty soon you find an extraordinary thing, the entire album is just utterly amazing! It's hard to believe, but you find this is one of the finest collections of music packed on one album. And you wonder, "Can other works by this artist be this good?" You go back to the record store to see what else was recorded and you buy the artist's previous record and take a chance. And, again, you are amazed that it is really good!!! Well, you wonder can this happen again? No way does lightning strike more than twice in the same spot, eh? You get the album before this and then the one before that and the incredible has happened, all four of them are just phenominal! Here's an artist that writes the music, plays many instruments and has a sweet, enticing voice! This is how I discovered Karla Bonoff in 1988. The album that started it all for me was her last original album, New World. What a glorious work from first note to last! Music is one of those intensely personal things that frequently can't be shared with full understanding because people's tastes are unique. 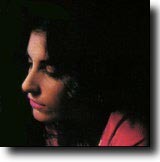 So it is entirely possible that you would not react as I did to the voice and writing of Karla Bonoff. But if I had to select the work of one artist to have with me on a deserted island it would be her's. I'd probably have to say that kd lang has the purest female voice I've heard. But considering song after song that powerfully moves the heart, Karla is the best. I first heard Sarah McLaughlin on her album Fumbling Towards Ecstasy. And while some just love that album, I then found it merely ok. Though with her release of Surfacing, I would call that the single best album by a female artist. With Karla Bonoff every one of her albums is ecstacy, and New World just about ties Surfacing for stunningly powerful music. From album to album the sweet consistency is amazing! And consider, the works are decades old and it still is an awesome body of work! But maybe it's just me. New World contains some amazing writing, singing, and musical production. Wynonna Judd and Linda Ronstadt performed a couple pieces that Karla wrote from this album and they became very popular. But to hear the original by Karla is much more of a delicious treat, exceeding the version popularized by the more notable stars. Wynonna's "Tell Me Why" is really very good, Karla's is even stronger and more powerful, more pure. Linda performed "All My Life" in a duet with Aaron Neville which won a Grammy. Karla's is warmer, sweeter, better. It is a high tribute to Karla's writing that the versions these stars have recorded do not stray far from the style of Karla's original. This, no doubt, is why these two versions became so well known. 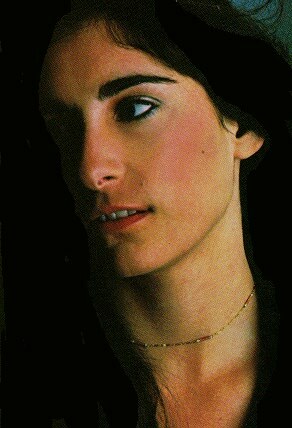 So well known, in fact, that most people are familiar only with Linda's and Winona's renditions. But as good friends, Karla had Linda singing harmony on New World and I believe Ronstadt returned the favor as Karla harmonized on Linda's version. (I count Linda performing six of Karla's songs on a variety of Ronstadt's albums.) But the killer pieces on New World are the title track and "How Long." For performance, production, writing and listening, it doesn't get any better than this. An incredibly auditory sensation. I can listen to the entire album and view it as a journey, a type of emotional "concept" album, taking one on a development of the soul from beginning to end, from seed to fruition. It has that sweep and cohesion. I don't listen to it often, I want it to remain fresh, a singular experience every time I hear it. I don't want to "get used to it," which happens when one constantly hears a piece of music. I've long wanted to write a fan letter to Karla. I'd love to be able to impart the precise impact New World, and indeed, all of her other albums have had on my musical existence. If I was a writer I would be able to select the right words and paint a true picture to convey how awesome it is to feel, to experience her songs. I haven't yet attempted to compose such a note. Words fail to express how one can get so spiritually moved by the right kind of music. That is the power of the musical sensation. It can deeply elevate the soul. New World is the last original solo album Karla has released. That was in 1988. I think it was too long after that I saw her in a segment on TV broadcast in Detroit, a show called A Day In the Life of Country. She was spotlighted singing harmony making a video with Vince Gill singing "When Will I Be Loved." I have that segment on video tape. I was surprised to see her in a Country Music venue, though I really knew little about her at the time. But when you're good, hey, you're good whatever the venue. New World was played on the "New Wave" radio station WVAE, the Wave, in Detroit, 92.3 FM. The station only lived for a few years, and played an alternative, almost "new age" kind of music, like Shadowfax, Sting, etc. In 1995 I was surprised to hear something new from Karla. She teamed up with three long time friends and released an album called Bryndle, named for the group. This included Kenny Edwards, who produced virtually all of Karla's albums, Wendy Waldman, a well known singer/songwriter, and Andrew Gold. And true to form, this work is just as impressive as the rest of Karla's albums. The instrumentation is clean and clear, the vocals and harmonies are sweet and tight, and it is a totally delightful musical experience. As an aside, regarding Bryndle and Karla, I recently discovered that Bryndle was working on a follow up album and it was released January 3, 2003 http://www.bryndle.com/site/bryndle2.html. So I bought it; so far it's only available on Byndle's web site at "the Bryndle Store," for $16 plus $2 shipping. 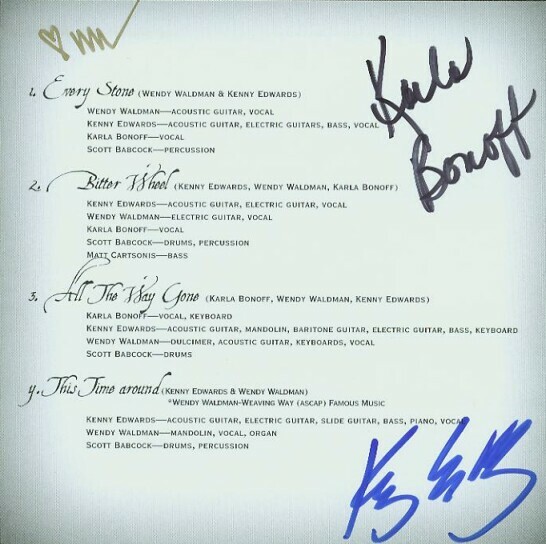 The inclusion of signatures of Karla, Kenny, and Wendy on the inside liner notes (not printed sigs, they personally signed each sheet!) is a fun personal touch. The music is nice. The instrumentation lives with much of the same soul, awe, and power of their first release. Their fans will definitely enjoy it. The album begins with incredible promise with the song Every Stone. The first sounds greeting your ears is an immensely cool, soft and mellow guitar riff which sounds like it shouldn't work but does with a quiet power. I should do a more complete review later. I'll just add a final comment that I'd love to have heard more of Karla's voice on the record. But after all, it is a cooperative effort of many individuals. Last year (2008) I walked into a record store (selling real vinyl!) and as I usually do, searched for Karla's records. Delightfully, I found the few of her original releases that I didn't own and scarfed them up, quite a steal for a few bucks apiece,and still in very good condition! They are mostly for decoration and display since I play the digital copies I've purchased, but they are a good historical record (no pun intended!) and a great keepsake! Good things come to those who wait. This has been obvious to me in all of Karla's solo work, that she would release a new album only after concluding a carefully crafted work and not before. And if she doesn't release another she can be proud of her accomplishment, of making a magnificent musical body of work, albums which sounds as fresh today (2009) as when first issued. How often can this be said about an artist? I hope that she decides to make another solo album since her voice and her writing deserves its own venue. And Kenny Edwards should produce it which would promise the same success of New World. Now, October of 2009, I see that she'll be coming to the Savannah Folk Festival a year from now. Finally, I'll be able to hear her in person! Finally!